← What Is Going On In The Iowa Legislature? 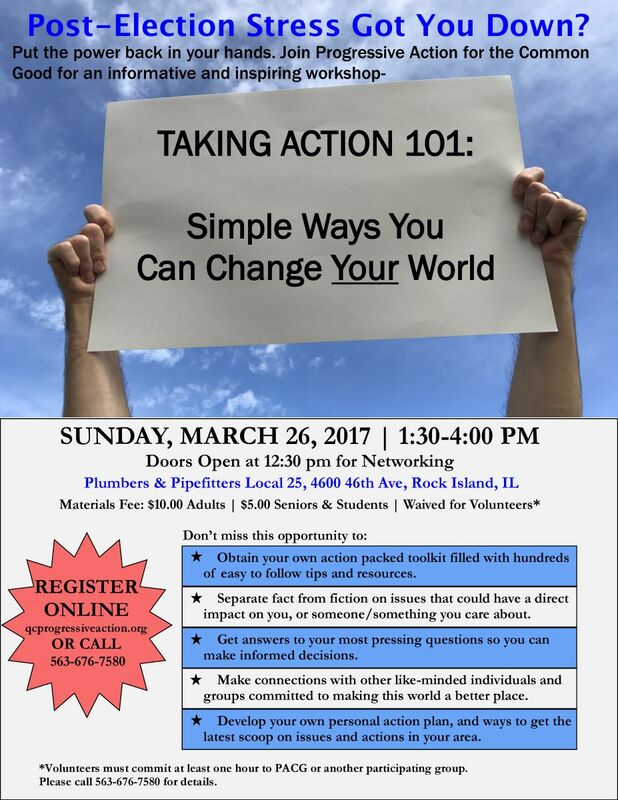 Obtain your own action packed toolkit filled with hundreds of easy to follow tips and resources. Separate fact from fiction on issues that could have a direct impact on you, or someone/’something you care about. Get answers to your most pressing questions so you can make informed decisions. Make connections with other like-minded individuals and groups committed to making this world a better place. Develop your own personal action plan, and ways to get the latest scoop on issues and actions in your area. *Volunteers must commit at least one hour to PACG or another participating group. Please call 563-676-7580 for details. This entry was posted in #trumpresistance, Progressive Action for the Common Good and tagged Iowa progressive actions, PACG, Post-election stress, Progressive Action for the Common Good. Bookmark the permalink.